Carbohydrate drinks, gels and bars: two carbs are better than one! Genuine advances in sports nutrition are bit like politicians who actually say what they think – rare enough to count on the fingers of one hand. But as Andrew Hamilton explains, recent research into carbohydrate nutrition has resulted in a new breed of carbohydrate products that really do deliver improved performance! Even if you’ve only a basic grasp of sports nutrition for performance, you’ll probably already know that ensuring an adequate intake of carbohydrate during training and competition is absolutely vital for performance – especially during longer workouts where even a small carbohydrate shortfall can lead to a significant drop in performance. But why is carbohydrate so important? The reason for this is simple; carbohydrate can be stored in the muscles as ‘glycogen’, which is broken down very quickly during exercise to provide large amounts of muscular energy for movement. While it’s true that fat is a concentrated source of energy and can also be stored in the body, it can’t be broken down to release energy as rapidly as carbohydrate. This is because burning fat for energy requires lots of oxygen and more intermediate steps to release that energy. Of course, fat-burning is fine when you’re working only gently and your muscles don’t need to be rapidly supplied with energy. In a race, match or hard training session however, you’ll need ample available carbohydrate to enable your muscles to work much more intensely. Another reason why carbohydrate trumps fat as fuel for vigorous exercise is that (for short periods) it can be broken down to release energy even when there’s no oxygen available – for example a flat-out sprint to the line. There is however one major big drawback to using carbohydrate as fuel – limited storage. Unlike fat, which provides tens of thousands of stored calories of energy (body fat), your muscles can only store around 2- 2½ hours’ worth of glycogen for hard exercise – ie around 300-400g in total. Regular endurance training can help boost this storage capacity by up to 50%, extending endurance by up to 20% before fatigue sets in(1-3), but the fact remains that your glycogen reserves are limited. This explains why the human body runs a ‘dual-fuel’ system. During gentle exercise, fat can be utilised almost exclusively for energy, which helps spare muscle glycogen. As the exercise intensity increases, the contribution to energy demand from glycogen steadily increases, until (when exercise becomes very hard) nearly all of the energy is being supplied from carbohydrate – see figure 1. This ingested carbohydrate becomes the predominant source of carbohydrate energy late in a bout of prolonged exercise (7), and can delay the onset of fatigue during prolonged exercise such as cycling, running swimming etc as well as improving power output(8,9). The research findings above have helped to shape the formulation of today’s popular carbohydrate drinks, gels and bars. For example, most of the drinks supply energy in the form of glucose, at a concentration of around 6% (60g dissolved in 1 litre of water), to be consumed at the rate of around 1000mls per hour, so that around 60g per hour of carbohydrate is ingested. However, while these glucose-based carbohydrate products provide a means of boosting endurance, the maximum absorption rate of 60g per hour actually only amounts to around 250kcals of energy per hour – a modest replenishment of energy compared to that being expended during training or competition. For example, a fit cyclist or triathlete can easily sustain an energy output of 900-1000kcals per hour during a race or sportive, around 800kcals of which would need to be provided by burning carbohydrate. This leaves a shortfall of at least 550kcals of carbohydrate per hour – a shortfall that has to come from limited and precious glycogen stores! Consuming larger volumes of drink per hour or more concentrated drink formulations is not the answer because we know from studies that 60g of glucose per hour is the maximum the human body can absorb and utilise. Consuming more than 60g of glucose per hour doesn’t result in better performance – in fact it might actually harm it because gastric distress may become a problem. In the mid 1990s, Canadian scientists were experimenting with giving carbohydrate drinks containing mixtures of two different sugars (glucose and fructose) to cyclists(10). In particular, the researchers wanted to see how well these mixtures were absorbed during exercise and oxidised for energy in the body. The key finding was that when the cyclists drank a 50/50 glucose/fructose mix, the amount of the ingested carbohydrate that the cyclists were able to use for energy production increased by over a fifth. The glucose/fructose blend drink resulted in around 50% extra carbohydrate oxidation than either of the glucose-only drinks, despite containing no more total carbohydrate than the high glucose drink (see figure 2). In plain English, this study showed that the maximum rate of glucose absorption into the body was around 1.2g per minute because feeding more glucose in the high-glucose drink produced no more glucose oxidation. 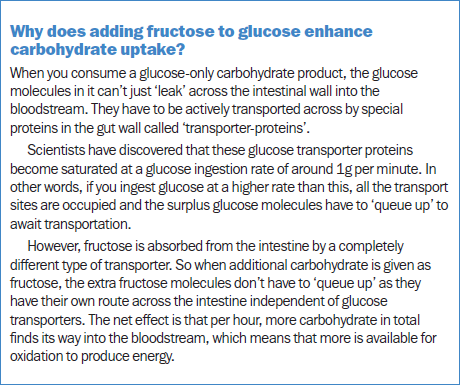 However, giving extra fructose did increase overall carbohydrate oxidation rates compared to feeding glucose only, which indicates that fructose in the glucose/fructose drink is absorbed into the bloodstream from the intestine via a different mechanism than glucose (see box). Lower perceived rates of exertion in the later stages exercise. Even more importantly, the same team of researchers proceeded to carry out further research showing that a glucose/fructose combination drink does translate into better performance. Compared to a glucose-only drink, ingestion of the glucose/fructose drink resulted in an 8% quicker time to completion of a 1-hour cycling time trial compared with a glucose-only drink(14). More recently, a number of studies have confirmed that 2:1 glucose/fructose drinks do indeed result in better real world performance. For example, a New Zealand study investigated performance in cyclists who were either mountain bike racing or performing racing simulations in the lab (94 minutes of high-intensity intervals followed by 10 maximal sprints)(15). Compared to a glucose-only drink, the glucose/fructose drink substantially reduced race time, with cyclists recording on average a 1.8% faster time compared to the glucose-only drink. Even better, the glucose/fructose drink resulted in a reduction in the incidence of abdominal cramps. It’s also worth pointing out that in this study, the cyclists only consumed 70g per hour of either drink (as opposed to 108g per hour in the earlier studies). In other words, the glucose/fructose drink proved its superiority even at lower intakes. In another study on competitive cyclists, the performance in two 100km cycling time-trials was compared(16). In one trial the cyclists drank a conventional glucose-only drink and in the other, a glucose/fructose blend. The results showed that all nine cyclists completed the 100km time trial significantly faster when they received the glucose/fructose beverage compared to the glucose-only drink (204 vs. 220 minutes respectively – ie almost 10% faster!). A further study looked at cycling performance in 18 trained cyclists who performed two separate trials(17). Each consisted of a 2.5-hour endurance ride at a moderately hard pace followed by a flat-out time trial of 40 miles. In one trial, they consumed a glucose/fructose drink, which provided 60g of glucose, 30g of fructose (and 5mg of caffeine) per hour. In the other trial, the cyclists used their own self-selected nutritional strategy – one that they believed worked best for them. The results showed that when the cyclists drank the glucose/fructose + caffeine drink, they completed the time trial 8 minutes faster (128 vs. 136 minutes) and with a significantly higher power output (212 vs. 184 watts) – a very big improvement! Unlike many sports nutrition products, the scientific jury has considered the evidence for mixed glucose/fructose carbohydrate supplementation and delivered a clear thumbs up. Compared to conventional glucose-only drinks, a 2:1 glucose/fructose drink is better able to extend endurance during longer training sessions/races, and is likely to be easier on the tummy too. The same goes for gels (which are in effect concentrated energy drinks) and bars (providing they are free from ingredients that could impede rapid carbohydrate absorption such as fat). If you’re not currently using glucose/fructose products, you’ll probably want to give them a try! Look for a ‘dual carb’ formulation that supplies 2 parts of glucose to 1 part of fructose (as used in the research studies) and be sure to mix/use it according to the manufacturer’s recommendations. 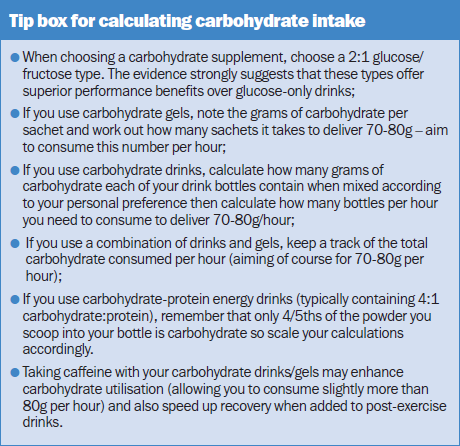 Understand however, that to fully benefit from glucose/fructose drinks, gels and bars, you need to be consuming in excess of 60g per hour of carbohydrate and ideally 70-80g per hour – because it’s only at these intake levels that they really deliver the goods over glucose-only products. The tip box below gives some advice on how to achieve this. Andrew Hamilton BSc Hons, MRSC, ACSM, is a sports science writer and researcher specialising in sports nutrition. A lifelong endurance athlete himself he has worked in the field of fitness and sports performance for over 30 years helping athletes to reach their true potential. Pre-race nutrition: the efficient performance diet!